1. Exaggerated emphasis on ugliness, hideousness, meanness, etc. 2. Highlighting of unnatural abnormalities are allowed within certain limits. 3. 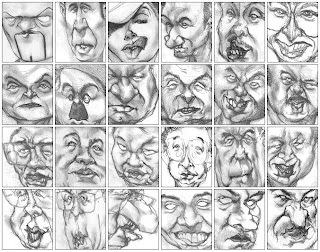 Any caricature should have some resemblance to a human being even if it does not represent a person. Around the world us are shown by a caricaturist from unexpected and witty point of view. The level of its witticism reflects , by its own way, the spiritual and intellectual life of the definite people, society, and epoch. Any caricature is the way of thinking, an illustration of the time; it can be created only in developed society, because only sound, healthy, and strong people can laugh at themselves. At the same time a caricature can be a complicated code, a kind of Aesopian language. A caricature can be evil and kind, sharply satirical and humorous. Humour is neither a sermonizing preacher nor a garbage collector, although these activities are always attributed to it. To understand the caricaturist's idea, one should have at least a bit of sense of humour, be ready to smile, to laugh. The difference between any animal and a human being is the human sense of humour.